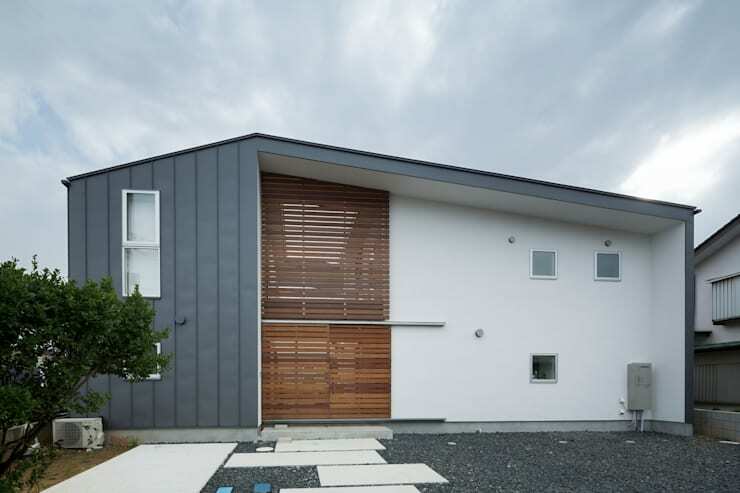 Welcome to the Japanese prefecture of Chiba, where a minimalistic yet exceptional residence awaits you. Owada Seed is owned by an elderly and enthusiastic gentleman who wants to spend his remaining life here, and offer this subtly lavish abode for rent in future. 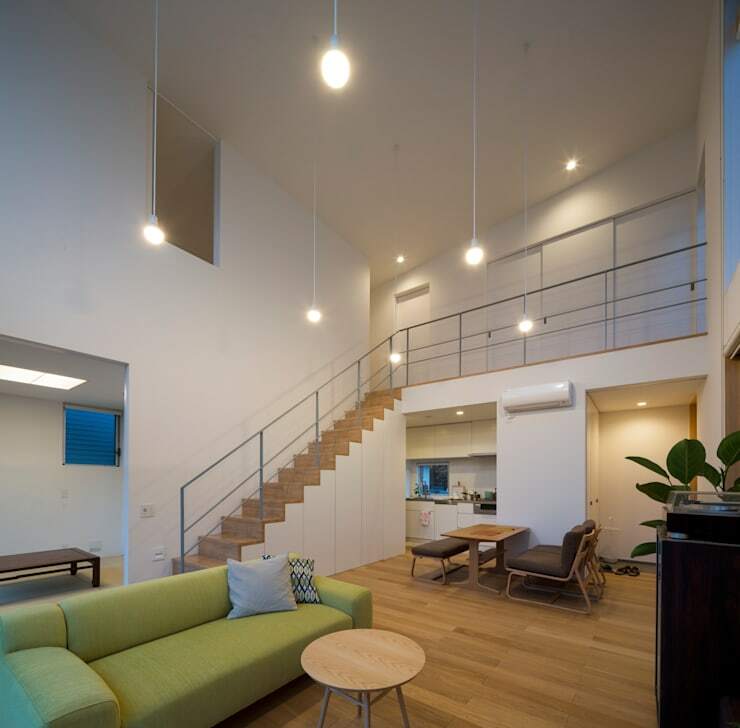 He desired this futuristically designed house to be full of spacious and fuss-free functional areas, neat and sleek designs, and provisions for natural light to filter in effortlessly. And that is exactly what the architects at Studio R1 Architects Office accomplished. Stylish outdoor spaces and lavish use of glass panels allow the interiors to embrace the outdoors beautifully. Trendy lights and cosy textures make sure that the ambiance in every room is soothing and homely. 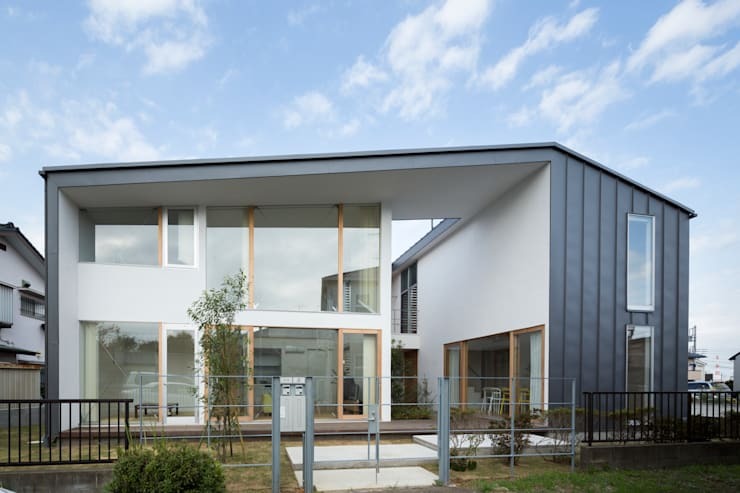 The slightly quirky white and grey facade makes a unique style statement, while sleek lines and hints of natural wood add to the visual interest. Massive glass doors and windows lend a fashionable look to the home, while allowing sunlight to flood the interiors easily. The two parts of the building are elegantly joined by a wooden patio which we will closely peruse later on. Don’t miss how the sleek bur robust boundary wall crafted from steel takes the chic quotient of the abode up a notch. Stylish screens made from wooden slats add character and warmth to the white and grey rear facade, while large pavers chart your path through the Zen garden. Grey rocks and verdant greens add organic charm here. 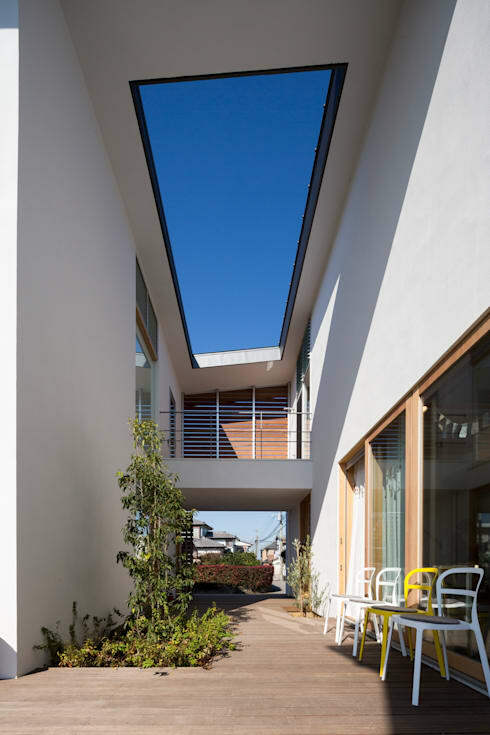 The wooden patio joining the two parts of this residence enjoys the presence of a massive skylight, through which sunlight gushes in. A couple of fun chairs in yellow and white wait here for you to indulge in lazy chats with friends here, while lush plants offer natural relief. 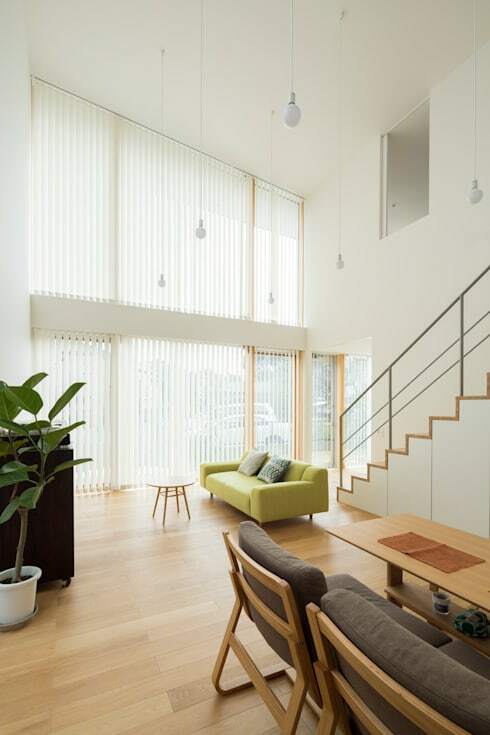 A smooth wooden floor and cheery white walls make the double height living area a bright and inviting vision. Large glass doors and high windows let sunlight pervade the interiors, thereby adding to the chirpy brightness. We love the simple but plush green sofa, the trendy coffee table and the pretty house plant as well. Softly glowing bulbs suspended by long chrome strings fill the living, dining and the compact kitchen too, with a serene look and feel. The earthy-hued dining arrangement is subtly fashionable and comfy, while the white kitchen is lined with sensible cabinets for ample storage. An industrial chic staircase leads to the airy mezzanine, and impresses with its white and wooden look. 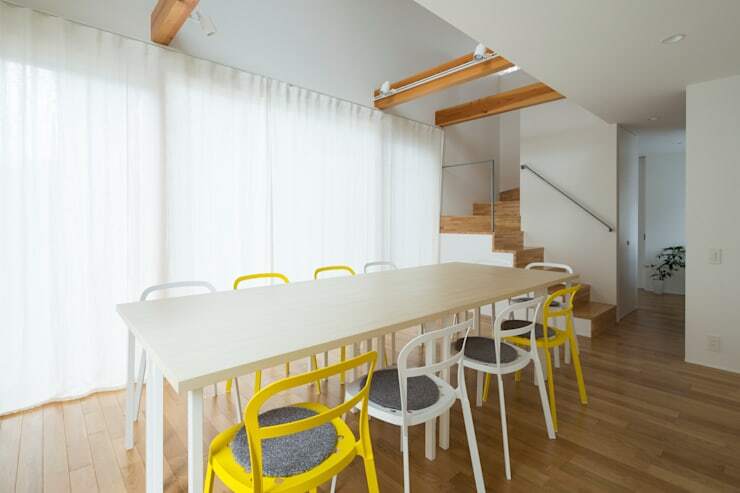 Here is another peppy dining arrangement with a sleek wooden table surrounded by stylish white and bright yellow chairs. What an appetising vision, isn’t it? Large glass doors adorned with dreamy drapes lead you from here to the patio. Now take a look at the dining space we just saw from the floor above. Note how glass doors open up to integrate this area with the wooden patio outside, when you are entertaining guests or hosting an open air party. This way, many people can be accommodated and catered to conveniently. 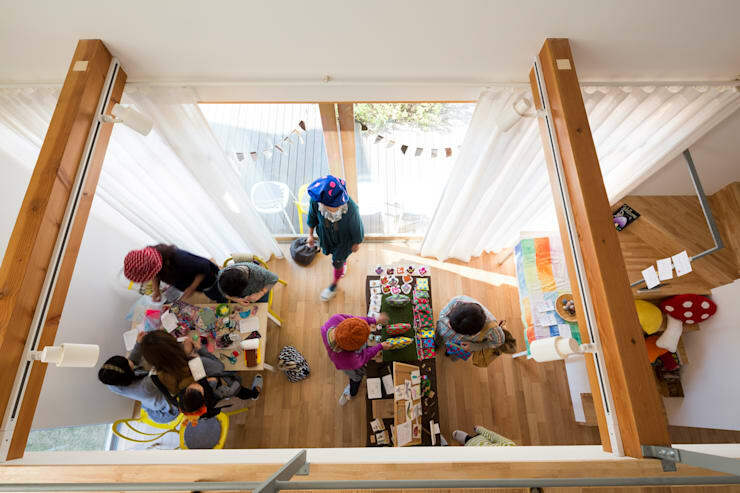 Hope you enjoyed the tour of this stylish and outdoor-friendly Japanese house as much as we did. For more inspiration, check out another tour - A Unique Apartment With A Curvy Surprise.